The Emmy Award-winning talk show, The Mystery Hour, is setting up a special standup show on Thursday May 25th, and you have two chances to see it! An 8pm and 9:30pm show will be happening at Casper's Chili in Downtown Springfield, but tickets are going fast so reserve online or email snodgrasscomic@gmail.com to see if there are walk-up tickets still available! You wont want to miss this show! Tomorrow I'll be hosting a great lineup of comedians and storytellers in Chicago with fellow WSLY producer, Shannon Noll. I designed the featured art for this month, and these posters will be available for purchase at the show! Where: Collaboraction Theater, in the Flatiron Building. Chicago, IL. When: Doors at 9:30, Show at 10:00pm. Cost: $5 suggested donation. BYOB. 1. We have a PODCAST (and it's really good, no lie), which you can easily find on iTunes and also Youtube. Each episode takes some of the best stories from various live shows from around the country and over the years, and puts them into one thematic piece. Subscribe on iTunes HERE. 2. We have more chapters! For over a year now we've had a wonderful Los Angeles chapter of We Still Like You. And We now also have wonderful chapters of our show in Denver and Louisville. Find out more by visiting the WE STILL LIKE YOU FACEBOOK PAGE HERE. 3. You can submit to be ON We Still Like You through THIS HANDY WEBSITE. We accept and review submissions on a rolling basis and use submissions in every Chicago show we book. If you'd like to get in contact with one of the other WSLY Chapters, or the podcast, email us at WeStillLikeYou@Gmail.com. Ben Kronberg dropping in to do a set at a WSLY apartment show. Thanks for keeping up with We Still Like You and helping us share empathy and shame even the most scummy scumbags through the power of comedy. More updates to come. Until then, come to a live show in a city near you, or check our Facebook page to see when we are traveling or performing at festivals. Our next Chicago show will be April 1st. I'm writing and working on a new one-time show with Steven King (STEEZUS) and Liz Maupin (Late Late Breakfast) called TRL: LIVE! We are bringing back all of your favorite mid-2000's musical memories for ONE NIGHT ONLY at The Hideout in Chicago. We're going to be counting down videos into the start of Spring Break! This is not a show to be missed. We Still Like You, Chicago's best storytelling show, is celebrating it's 3-YEAR ANNIVERSARY. In the last year we've expanded chapters to Denver and Louisville, while our Los Angeles chapter goes on strong. While we've now had hundreds of performers on the show, this year's poster features just a handful of first-timers from the last calendar year, including Jackie Kashian, The Puterbaugh Sisters, Brandie Posey, Geoff Asmus, Kristen Toomey, Tim Barnes, John Michael Bond, and many more. The show will be in the Flatiron Building in Chicago, in a new theater (for us) called The Pentagon (usually we are in The Salon). BYOB as always, and there's a suggested donation of 5 dollars to pay for the renting of space and our performers, which this year includes Kristen Toomey, Lily Be, Sean Flannery, each of our producers, and more! 10:30 start time, 10:00 doors. Here are the shows I've booked so far in December. They're all in Chicago except for two shows on 12/23 which are at the Blue Room in Springfield, MO (more info on that CRAZY SHOW) coming up soon. Also, be on the lookout for more info regarding the Chicago show on the 26th which I am organizing with Bobby Budds and Schubas Tavern to feature many great Chicago comics returning home from New York and LA. One week from today, on November 1st, I'll be doing my first HOUR of comedy at the Crowd Theater in Buena Park, Chicago (near the Sheridan Red Line). The show is called Tyler Snodgrass Does An Hour of Sincere Comedy. It's only $5 at the door and the show is only happening this one time. So this isn't an album or a special recording, this is a one-time show. Don't miss it! Featuring comedians Dan Sheehan and Steven King. Poster design by Clare Austen-Smith. Hey folks, I'll be in Seattle WA for a few days and am getting to jump on two great shows on Friday 10/7. Both shows featuring Seattle favorites: Coffee Surrounded By A Fog Of Gloominess, and The Idea Of Grunge! Here's some cartoons I drew. Here's the hot new game no one asked for: Megadeth Song or Attack Move From Pokémon Games?? It's simple: I give you a word or phrase, and you guess if it's a song written by heavy metal veterans Megadeth, or an attack move a Pokémon could perform on one of the Nintendo video games. I'm excited to announce that I'll be headlining the WIP Theater in Edison Park, Chicago, on the weekend of Sept 30/Oct 1. Kaitlyn Grissom is featuring, who is a super wonderful and hilarious comic. Show starts at 10pm. Buy tickets online or at the door. I'm seven portraits deep into WE THE LIZARD PEOPLE, my new tumblr project. It features NEVER BEFORE SEEN, LONG-LOST PORTRAITS of our American Presidents depicted as the shape-shifting Lizard people we all knew they secretly were. Hey friends! I got added to some shows this week, so here are some things you can check out! TONIGHT (8/15) Featuring at 100 Proof Comedy. 8pm start at Comedy Sportz Chicago. Thursday (8/18) Doing standup at Flat Iron Comedy. 7:30pm start at The Flatiron Building in Chicago. Saturday (8/20; 2 shows!) Telling a story at the Mortified 3 Year Anniversary. 6pm at Lincoln Hall in Chicago. This show WILL SELL OUT so get tickets soon! THEN I'll be at We Still Like You Goes Outside 2 at 10pm. Check out WSLY's Facebook page for more details. Sunday (8/21) Performing at Whiskey Journal Live. 7:30pm start at The Comedy Bar in downtown Chicago. Monday (8/22) Doing standup at CAMP, a really great new comedy show. 8pm start. 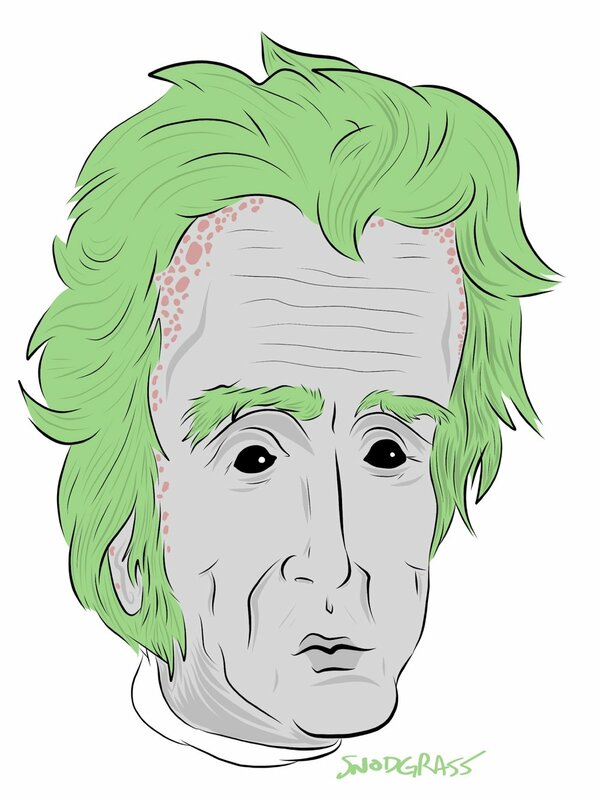 I've got a new project starting called WE THE LIZARD PEOPLE, which will feature original portraits of all the Presidents of these United States...as the Lizard People we all know they secretly were. PLUS FUN FACTS! Here is a sample of our first Lizard President, George Washington. Thanks in advance for embracing history with me. Thanks for visiting my new website. This is where I'll be posting booking information, my standup and improv show schedule, pieces of writing from around the Web, drawings, and more.